Albert Ludwigs University of Freiburg (German Albert-Ludwigs-Universität Freiburg) was founded 1457 in Freiburg by the Habsburgs. One of the oldest universities in Germany, it has a long tradition of teaching the humanities, social sciences, and natural sciences. 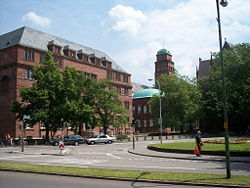 The university is one of Germany's most prestigious, and is a leading research as well as teaching institution in Europe. While it suffered many challenges in its long history, having to relocate on several occasions due to wars and changing political as well as religious situations, it finally settled permanently in the historic and beautiful city of Freiburg. With its long-standing reputation of excellence, the university looks to both the past to maintain its academic and cultural heritage while at the same time is always forward looking, developing new methods and opportunities so as meet the needs of the changing world. The University of Freiburg has been home to some of the greatest minds, counting notable philosophers and theologians such as Hannah Arendt, Rudolf Carnap, Edmund Husserl, Martin Heidegger, and Karl Jaspers, as well as numerous Nobel laureates. The school makes every attempt to give each student a quality education. According to the university's mission statement, presented on the university's website, it declares that the Albert Ludwigs University of Freiburg looks to both the past and future for how it operates today; conscious and proud of its long history, the university pays special attention to maintaining its academic and cultural heritage while at the same time developing new methods and opportunities so as meet the needs of the changing world. The school is also very conscious of giving every student a quality education, developing state-of-the art research facilities and developing cross-disciplinary programs. The Albert Ludwigs University of Freiburg has a long-standing reputation of excellence. The university's reputation attracts world-class professors and researchers to Freiburg, leading to an excellent position in the 2005 Humboldt Ranking, which measures the number of research stays by foreign fellows and award winners sponsored by the Humboldt Foundation. Freiburg achieved a particularly high rank in the life sciences, finishing second. In 2007, it was named the 94th, out of 500, top universities around the world. Within the top 100 European universities, Albert Ludwigs University of Freiburg was named the 31st best. In university rankings of German magazines and periodicals the Albert Ludwigs University has established itself as one of Germany's top universities. The faculties for law, medicine, history, English studies, biology, and pharmacology achieve especially high scores. Originally Albrechts University, the university started with four faculties (theology, philosophy, medicine and law). Its establishment belongs to the second wave of German university foundings in the late Middle Ages, like the Eberhard Karls University of Tübingen and the University of Basel. Established by papal privilege (papal bull) the University in Freiburg actually was—like all or most universities in the middle ages—a corporation of the church body and therefore belonged to the Roman Catholic Church and its hierarchy. The bishop of Basel consequently was its provost or chancellor (Kanzler), the bishop of Konstanz was its patron while the real founder of the university was the sovereign, Archduke Albert VI of Austria, being the brother of Frederick III, Emperor of the Holy Roman Empire of the German Nation. At its founding, the university was named after Albert VI of Austria. He provided the university with land and a huge amount of endowments as well as its own jurisdiction. Also he declared Albrechts University as the "county university" (German Landesuniversität) for his territory—in the past including an area from Alsace to Tyrol—until it was handed over to the Austrian House of Habsburg in 1490. Shortly after that the university had a time of prosperity when numerous later famous humanists were educated there like Geiler von Kaysersberg, Johann Reuchlin or Jakob Wimpfeling. The importance of the university decreased during the time of the Counter-Reformation. To counter those tendencies, the administration of two faculties was handed over to the Roman-Catholic order of the Jesuits in 1620. (The two faculties were, of course, Theology (or Divinity) and Philosophy.) Since 1682 the Jesuits built up their college as well as the Jesuit church (nowadays the "University Church" or Universitätskirche). At times, especially during the disorders of the Thirty Years' War, the university had to move out of Freiburg temporarily, e.g. from 1686 to 1698, when French troops devastated Freiburg and the southern parts of the upper Rhine region. After Freiburg as the capital of Further Austria was re-conquered, a new time began for the university by the reforms of Empress Maria Theresa of Austria. The requirements for admission were changed for all faculties in 1767 (before that time only Roman Catholics were allowed to study) and Natural Sciences were added as well as Public Administration. Also in 1767, the university became a governmental institution despite the Church's protests. The Church finally lost its predominant influence on the university when the Jesuits were suppressed following a decree signed by Pope Clement XIII in 1773. It also might have been the Zeitgeist and the official line of the new Emperor Joseph II (successor and son of Empress Maria Theresa of Austria) that his Patent of Tolerance which ensured Protestants the same rights as Catholics (published 1781) finally began an era of Enlightenment within the domains of the Habsburg, nowadays known as an era called "Josephinismus." When Freiburg became a part of the newly established Grand Duchy of Baden (in German "Großherzogtum Baden") in 1805 (after Napoleon occupied the area of the formerly Further Austria), a crisis began for the university in Freiburg. Indeed there were considerations by Karl Friedrich, Grand Duke of Baden and Karl, Grand Duke of Baden to close down the university in Freiburg while both of them thought that the Grand Duchy could not afford to run two universities at the same time (the Ruprecht Karl University of Heidelberg also already existed since 1386). The university had enough endowments and earnings to survive until the beginning of the regency of Ludwig I, Grand Duke of Baden in 1818. Finally in 1820 he saved the university with an annual contribution. Since then the university has been named Albert Ludwigs University Freiburg (Albert-Ludwigs-Universität Freiburg) as an acknowledgment of gratitude by the university and the citizens of Freiburg. Kollegiengebäude I, erected in 1913 as main building of the university. In the 1880s the population of the student body and faculty started to grow quickly. The excellent scientific reputation of Albert Ludwigs University attracted several researchers like economist Adolph Wagner, historians Georg von Below and Friedrich Meinecke, or jurists Karl von Amira and Paul Lenel. In 1899 Freiburg became the first German university to accept a female student. Just before World War I the university counted 3,000 students. After World War I the highly distinguished philosophers Edmund Husserl and (since 1928) Martin Heidegger taught at Albert Ludwigs University, as well as Edith Stein (she was the assistant of Edmund Husserl, the predecessor of Martin Heidegger). On the field of social sciences, Walter Eucken developed the idea of ordoliberalism, which consequently is also known as the "Freiburg School." In the beginning of the twentieth century several new university buildings were built in the center of Freiburg, including the new main building. During the "Third Reich" the university went through the process of Gleichschaltung like the rest of the German universities. This means that most of the non-governmental or non-state-controlled institutions, unions, clubs, and associations of students were illegal (Catholic student fraternities were declared illegal). Under the rector Martin Heidegger all Jewish faculty members, among them many excellent and renowned Jewish scientists and professors, were forced to leave the university in accordance with the "Law for the Reintroduction of Professional Civil Service." After World War II the university was re-opened. Since March 2006, the university has been a member of the League of European Research Universities (LERU). Having grown with the city since the fifteenth century, the university's buildings are deeply intertwined with the city of Freiburg. There are three large campuses scattered throughout the city (the university center next to the historical city of Freiburg, the institutes quarter and the applied sciences campus), but other buildings can be found all over Freiburg. The University Medical Center Freiburg (Universitätsklinikum Freiburg) is one of the largest medical centers in Germany, as well as one of the most reputable. It is the teaching hospital of the University. In 1751, the university's medical faculty began charity medical activities. In 1780, the first general clinic (Allgemeines Kranken-Spital) was established. In the nineteenth century a medical center was built, followed by an entire campus with different specialized departments. In 1887 the psychiatric clinic was constructed. In 1926 the architect Albert Lorenz began building a modern hospital complex at the present hospital location. During the bombing raid of 1944, almost all medical center facilities were destroyed. In 1952 the reconstruction of the medical center in accordance with the original plans began. Since then, the medical center has continuously expanded and added many institutes and satellite clinics. Today, the hospital boasts almost 1,800 beds and treats 54,000 in-patients each year. Over 300,000 out-patients are seen annually. The University Medical Center employs more than 8,240 people, including over 1,000 doctors. It consists of many specialized clinics and institutes, as well as research facilities and lecture halls. The University Medical Center Freiburg enjoys an excellent international reputation, due to world-class medical treatment and extensive clinical research. Many sensational achievements have been made there, such as the first implantation of the artificial heart Jarvik-2000, and the first brain surgery assisted by robots, a procedure available in only a select few hospitals. Fakultät für Angewandte Wissenschaften der Universität Freiburg: rechts das Gebäude 101 (Bibliothek, Hörsäle, Seminarräume, Dekanat), in der Mitte zwei Lehrstuhlgebäude, links hinten die Mensa; die Objekte in der Mitte sind Teile der Installation Jump and Twist by Dennis Oppenheim. 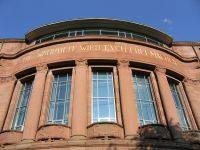 The university also has an excellent library with a large collection and a museum, Uniseum Freiburg, which traces the history of the university from its inception to modern day. Its collection includes invaluable artworks, photographs, writings, and more. The Albert Ludwigs University of Freiburg offers a wide variety of degrees in both the sciences and humanities, mostly at the undergraduate and graduate level. It is within the Medical program that the university offers its most varied programs of study; degrees in medical assistance, technicians, nursing, practicing and research doctors, as well as dental studies are all offered by the Faculty of Medicine. The University of Freiburg and its faculties offers many opportunities for excellent graduate education and research. In an evaluation of European graduate programs conducted by the Centrum für Hochschulentwicklung, a German think tank for higher education, Freiburg University ranked in the top group for all subject fields examined. Apart from the many graduate programs of its faculties, Freiburg has set up additional specialized graduate schools and graduate research centers to help promote top-level research and ensure excellent future prospects for graduates. 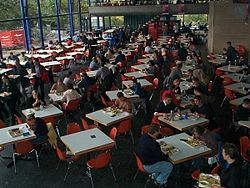 Students eating in the central mensa (cafeteria) on Rempartstraße. Today the university has a student population of around 22,100, including both undergraduate and graduate students. Approximately 16 percent of these students are foreigners. Even though it is not located in a large metropolitan area, the Albert Ludwigs University of Freiburg does offer students plenty of opportunities beyond their academic studies; there are numerous student clubs and activities offered on campus, sports clubs for students to take part in athletic ventures as well as for other students to be spectators, plays and movies, and the city of Freiburg does offer a nightlife. Students are also encouraged to take part in the local workforce through job placements by the division of German Labor Division. With its long tradition of excellence, the University of Freiburg has been home to some of the greatest minds. Among the distinguished affiliates, there are numerous Nobel laureates and Leibniz Prize winners, in addition to key philosophers and theologians. ↑ 1.0 1.1 Albert-Ludwigs-Universität Freiburg (2007) "Mission statement of the University of Freiburg" Retrieved November 25, 2007. ↑ Alexander von Humboldt Stiftung Foundation (2006) "Humboldt Rankings: Germany's most internationally attractive universities " Retrieved November 25, 2007. ↑ Institute of Higher Education, Shanghai Jiao Tong University (2007) "Top 500 World Universities (1-99)" Retrieved November 24, 2007. ↑ Institute of Higher Education, Shanghai Jiao Tong University (2007) "Top 100 European Universities" Retrieved November 24, 2007. ↑ CHE Centrum für Hochschulentwicklung (2007) "Homepage" Retrieved November 25, 2007. ↑ 6.0 6.1 6.2 Albert-Ludwigs-Universität Freiburg (2007) "The History of the Albert-Ludwig University of Freiburg" Retrieved November 25, 2007. ↑ 7.0 7.1 Thomas Albert Howard, Protestant Theology and the Making of the Modern German University, (Oxford University Press, 2006, ISBN 0199266859). ↑ 8.0 8.1 Office of Medical Services and International Business Development (2007) "History of the University Medical Center Freiburg" Retrieved November 25, 2007. ↑ "Uniseum Freiburg" (2007) Retrieved November 25, 2007. ↑ Universität Freiburg mit vier Fächern in der Top-Gruppe Kommunikation und Presse, November 29, 2007. Retrieved December 21, 2007. ↑ International Graduate Academy (IGA) Freiburg Retrieved December 21, 2007. All links retrieved February 24, 2016. History of "Albert Ludwigs University of Freiburg"
This page was last modified on 16 February 2019, at 23:01.